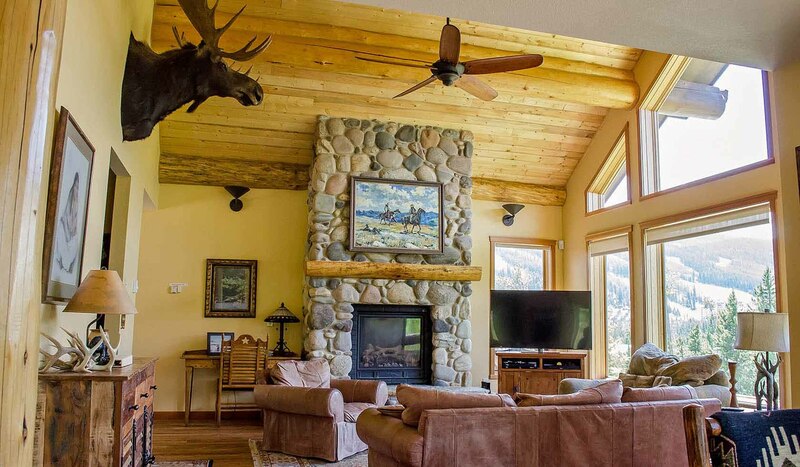 Located on a gorgeous bluff just above Big Sky Resort's mountain village, Sioux Lodge is minutes from the Mountain Village and has direct ski trail access to the White Otter lift. Every single room has stunning views of Lone Mountain. The Sioux Lodge is a 4-bedroom, 3.5-bath home. This house is perfect for families and for entertaining friends. With 3,200 square feet of luxury living on two levels, the house includes a first floor master with Jacuzzi tub and separate shower. On the upper level you will find a stunning great room with expansive windows and views of Lone Mountain, cozy furniture, and a floor to ceiling fieldstone fireplace. On the lower level, you will find 3 bedrooms (one has its own private bath); 2 baths; a rec room with satellite TV; a 7-person hot tub just outside the rec room on our lower level deck; and a special 'kids' room with 2 sets of bunk beds. (Crib and high chair also supplied). The house also has over 900 feet of deck space in five different locations for privacy and enjoyment during the warmer months and spring like winter days. You will find all the comforts of home including a fully stocked gourmet kitchen with all the tools, a complete spice rack, satellite TV, a desk for quick office tasks, a 2-car heated, attached garage, and so much more! It is not unheard of to have mother and baby moose outside your door in the morning! You are at the base of Big Sky resort, 1.2 miles form the base of Moonlight Basin Ranch, mountain bike or Frisbee golf the mountain in the summer and shop the mountain or meadow villages all year. You are also 9 miles from Blue Ribbon fly fishing, white water rafting, kayaking and floating in the Gallatin River. 40 minutes to fly fish and snowmobile West Yellowstone. Call us now!